The green trail which starts just south of the wood shed and ends at the tractor path is the camp’s tree identification trail. 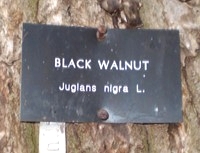 There are twenty two species of tree labelled with tags like the one pictured to the left. The trail is marked with green tape and anywhere that there is a ring of black tape under the green there is a labelled tree nearby. There are maps and tree identification guides available for a nominal fee in the HICOP. The maps (download a map) show the locations of all the marked trees and the guides show how to identify each species. Another alternative is to have one of our guides take your youth on a hike to identify the trees. Guided hikes must be booked in advance.